Since the very early days, chemists have tried to organise the elements so that their properties can be studied with minimum of effort. In this endeavour, Mendeleev put forward the periodic table of elements. Further development of chemistry, especially in the sphere of quantum mechanics, has enabled us to rationalise the existence of all elements in modern Periodic Table and their arrangements are applied to elucidate the chemical properties. The very first criteria to explain the chemistry of any species, is to identify the arrangement of electrons because, the chemical reactions are essentially the rearrangement of electrons. In order to understand the nature of electronic configuration, we need to understand the terms orbitals and energy levels. A planet moving around the sun in a fixed path is said to be moving in an orbit. Although from a simplistic view, electrons may look like going around the nucleus in a similar way, in practice, they populate regions of space which are called orbitals. To be able to assign a definite path, it’s absolutely necessary to know the location of the electron at an instant and to be able to predict its movement the next instant. The Heisenberg Uncertainty Principle says – “it is impossible to define with absolute precision, at the same time, both the position and the momentum of an electron” which rules out any definite orbit. Since the orbitals are only telling us about the probability of finding an electron, it’s imperative to be as sure as possible about the whereabouts of the electron inside an atom. 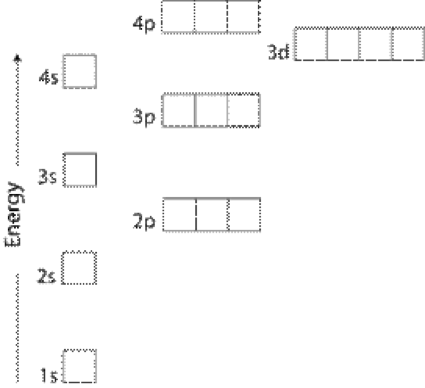 For usage in various applications, these orbitals are labelled as s, p, d, and f with precursors 1, 2, 3, 4, 5, 6, 7 ……and so on. The numbers represent the principal quantum number (n) or the “energy levels”. The electrons in an energy level bearing n = 1 have less energy than those in level having n = 2 or more. Similarly, as the value of n increases, the energy of the electrons residing in those levels also increases. The other identifying feature of an orbitals for their representation as s, p, d, and f, is the angular momentum quantum number (l). It determines the shape of the orbitals and the energy of each level within a given principal quantum number. For example, a 3s orbital is lower in energy than a 3p orbital which is lower in energy than a 3d orbital. Orbitals are the region around the nucleus in which there is maximum probability of locating an electron. Principal quantum number n determines the energy of the orbitals while angular momentum (azimuthal) quantum number determines some of its energy and largely its shape. Herein starts the anomalous behaviour which is a result of the complex mathematics which are avoided here. As a replacement, we would consider a diagrammatic representation along with the physical view of the arrangement of electrons. The inter-electronic repulsion inside the atoms is the cause of the chaotic order of the orbital energies. 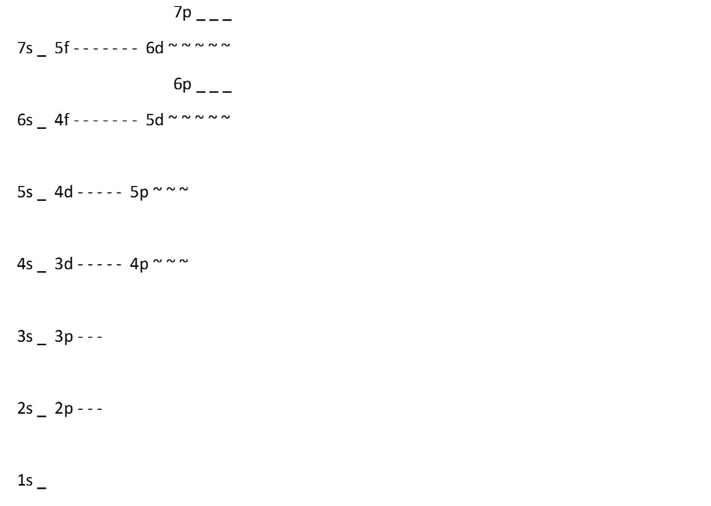 Its observed that everything looks correct until the 3p subshell is passed. It is expected that the 3p subshell will be followed by 3d, but it is really the 4s which follows. Although their energies are close, 4s is lower in energy because of electrons in this orbital being able to move close to the nucleus due to the symmetrical spherical shape of the s orbital. The electrons in the 3d orbitals are not able do this and hence are higher in energy. The order of increasing energy of orbitals as shown below, is backed by experimental data. 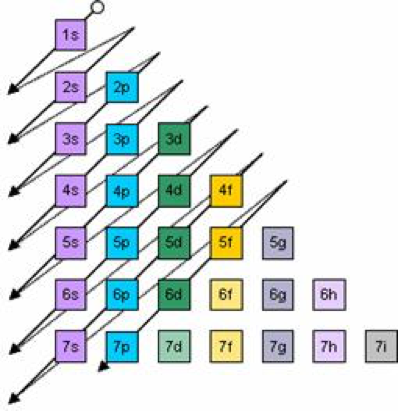 The arrangement of electrons within an atom is called the electronic configuration and the electrons are filled up according to the energy of the levels as: 1s, 2s, 2p, 3s, 3p, 4s, 3d, 4p, 5s, 4d, 5p, 6s, 4f, 5d, 6p, 7s, 5f. Filling up of the electrons and the resulting electronic configuration of an element is governed by some rules which are pivotal to the understanding of the chemical processes. There are 3 rules which need to be followed for the accurate prediction of the electronic configuration. “No two electrons have the same 4 quantum numbers n, l, m, s”. It essentially means that if electrons must occupy an atomic orbital, they must have opposite spin. This also limits the number of electrons occupying an orbital to two. “For a given electron configuration, the lowest energy term is the one with the greatest value of spin multiplicity”. In simple terms, it means that every time, electrons are first filled up in an orbital singly and only when needed, do the electrons with opposite spin pair up. In other words, each orbital in the subshell is filled up by electrons one by one before the pairing up with opposite spins. “The orbitals with lower energies are filled before those with higher energies”. This rule works in tandem with the two previous rules. The arrangement of the electrons in the elements follows a pattern and all the elements can be classified accordingly in the periodic table. The general trend in the filling up of orbitals follows the order as shown below and the configuration of each element can be deduced by carefully following the 3 rules. There are however, some exceptions to the electronic configurations. Half or fully filled orbitals do have lower energy as compared to other orbitals and this makes them more stable. Therefore, the configuration of elements or ions having either half or fully filled orbitals are distinct. An experimental evidence for the existence of orbitals and their energies can be found from the ionisation energies. “It is the energy required to remove an electron from a gaseous atom or ion”. First Ionisation energy: The energy required to remove an electron from the gaseous atom. Second, third and further ionisation energies result from the successive removal of electrons. Whenever there is a sudden big difference in successive ionisation energies, it indicates the change in the orbital from which the electron was removed. Hence, it gives an experimental proof of the existence of discrete energy levels. 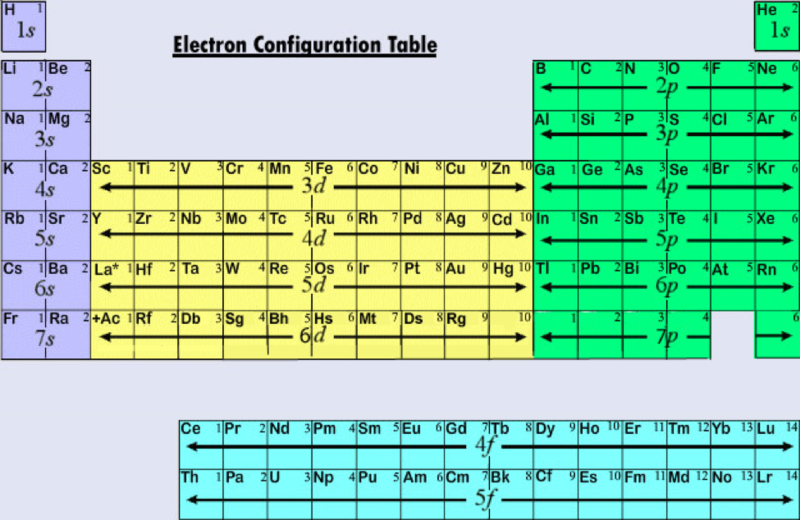 Three rules are to be followed for predicting the correct electronic configuration of elements. “For a given electron configuration, the lowest energy term is the one with the greatest value of spin multiplicity”. “The orbitals with lower energies are filled before those with higher energies”. There are exceptions to the general trend which is due to extra stability of half and fully filed orbitals. “Ionisation energy is the energy required to remove an electron from a gaseous atom or ion”. It is the experimental verification of presence of atomic orbitals.